Well folks, it's that time of year again: Ashvember. That's right, the completely made up birthday bonanza that I created for myself. And because I'm turning 28 in just a few hours, I wanted to throw out a last minute birthday list item I am dying to have. Sure, I asked for a new set of pots and pans, a new jacket, and other boring practical things an adult should ask for but I forgot to add the one thing that would really set my 28th year on earth off right. I mean the gift that would truly spice up my life... and yours for that matter. Have you ever been at a sporting event and lost your mind when you see that mascot come out with one? The answer is yes, because you have, because free shirt. And sure, you're at the top of the stadium, but it's a cannon. "Dunk this Donut...into some coffee!" "Hope you all are ready for this because at the end I'm bringing out my tshirt cannon." 1. I really let those folks down. 2. I need one of those things more than anything. Think about how much fun parties would be! It wouldn't just be used for t-shirts either. "Ashley could you hand me a biscuit." "Sure mom hang on just a second." 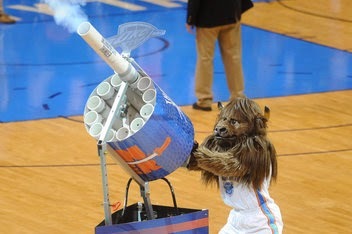 ALL OF SUDDEN WE'RE NOW THE OWNERS OF A BISCUIT CANNON. So in case you're in the mood to pay it forward...holla atcha girl. You know what would make up for that lame joke? If I shot a t-shirt into the air and you caught it. I just want to say that I am absolutely dying inside at how hilarious all your blogs are, especially this one. I was secretly hoping tshirts would fly out of the computer screen as I read it, because I love those things as well! Cant wait to hear your thoughts on last nights bachelor, and thank you for the hilarious entertainment!